This post is going to be a how-to post. When I released my book and made it available through my website, I got questions about how to actually get that file onto the Kindle. Most people are used to purchasing ebooks directly from Amazon, and the books are sent directly to the Kindle. You CAN download books from other sources, though, and put them on your Kindle. It just takes a couple more steps. Step one: Download your file and know where it’s located on your computer. You will see a list of formats available. Since we are downloading for Kindle, be sure to click the link for the Kindle version. On my Mac, the file automatically downloads and is saved in the folder titled “Downloads.” This is probably similar on a PC. Now that you’ve downloaded it, go find the file and open up the folder it’s in. If you can’t find it, search for “pg1342” on your computer and it should show you what folder it’s in. Make a note of this, since this folder is where things you download are automatically going. Step two: Plug in your Kindle and open up the folder. 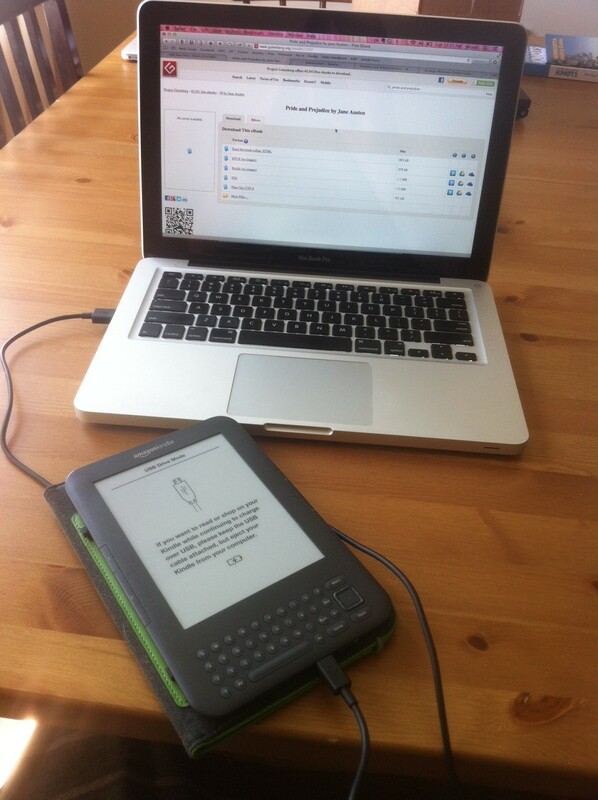 Believe it or not, when you plug your Kindle into your computer, it will show up on the desktop or in Finder (on a Mac) the same way a USB drive does. Go ahead and plug it in, then open it up. There will be folders inside. Click on the one called “Documents.” You will see all of the files for the books you already own. Step three: Move your downloaded file from the Downloads folder to the Kindle’s “Documents” folder. You can drag the file that you downloaded straight into that Downloads folder. Or, you can copy and paste it from one folder to the other. Now you can unplug your Kindle from your computer. Be sure to “eject” the device in the way you normally would for any other device, like a USB drive, before you unplug it. You will find your ebook ready and waiting for you to read! You can even repeat the process and download a ton more books.